Yet another sport that can be conquered with a drink in hand! Come and hone your frisbee skills in one of the most social leagues we offer. Baltimore Kan Jam leagues are played all over the city of Baltimore and are available on various nights throughout the week. Meet us for some laughs and a good time. Volo City does Baltimore kan jam like no one else in the city. You don’t just show up, play, and go home at Volo City. You show up, play, and make friends that last a lifetime! It’s time to perfect that kan jam form! 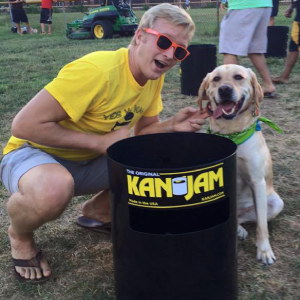 Sign up for Baltimore kan jam today as a team, small group of friends, or solo. Stay tuned! Spring KanJam will be here soon! Check back soon for Kan Jam leagues! Spring Kan Jam coming soon! Minimum players for a full Kan Jam team is 4. If you do not meet this minimum your team will be merged with free agents. Teams will play 2-3 matches a night. Matches consist of a best of 3 game to 21 points. Team T-shirts will be delivered to the teams by the 2nd week of the league.